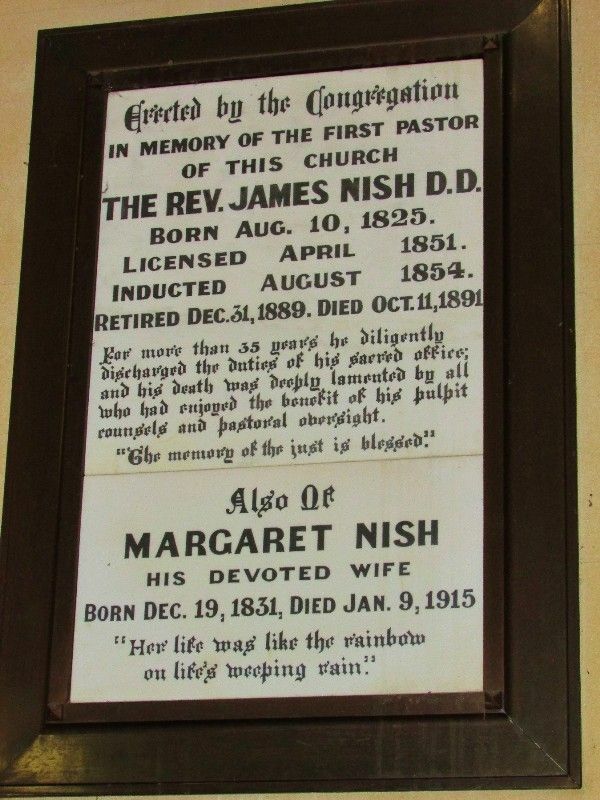 Marble tablet erected in memory of Reverend James Nish who established the church in Bendigo in 1854 and was pastor for 35 years. The panel erected also pays tribute to his wife Margaret Nish who died in 1915. The inscription panel originally formed part of an ornate marble tablet. The Rev. James Nish, a young man of 29 who had recently arrived from Scotland, was appointed the first Minister of the newly formed Congregation. He arrived in Bendigo on 24th August, 1854. The first Presbyterian Church building (St. Andrew’s), built in early English Gothic style was opened and dedicated for worship on 19th January 1859. 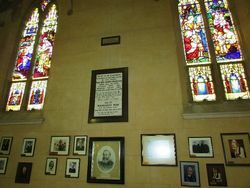 A tablet has just recently been erected in St. Andrew's Church, Bendigo, to the memory of the late Rev. 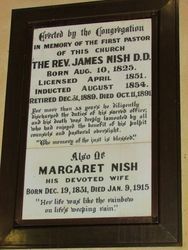 Dr. Nish, who established the church in Bendigo in 1854, and remained its pastor until he took up the position of Clerk of the Assembly in 1889, a period of 35 years. The tablet is a beautiful and costly one. It is of Gothic design, and quite original. Seeing that it was of local production, its value is perhaps enhanced. It is composed chiefly of Oamaru (N.Z.) stone, which has a soft pleasing appearance. The design is rich by reason principally of the various coloured marbles with which it is composed. It represents a large white archway with smaller arches in perspective. The top of the large arch has Gothic tracery with panels of royal rouge, Mexican onyx (yellow), and Paphony (dark green) marbles. There is a small star of statuary marble in the centre of the rough marble, and the panels of the small arches are filled with Paphony marble. The main arch is supported by clusters of Sienna marble. The marbles are highly polished and impart an appearance of richness to the whole, yet it does not detract from the object sought. The inscription is upon a panel of statuary marble enclosed by a border of black. It reads as follows : — " Erected by the congregation in memory of the first pastor of this church, the Rev. Dr. James Nish, D.D. Born 10th August, 1825. Licensed, April, 1851. Inducted, August, 1854. Retired, 31st December, 1889. Died, 11th October, 1891. For more than 35 years he diligently discharged the sacred duties of his office, and his death was deeply lamented by all who enjoyed the benefit of his pulpit counsels and pastoral oversight. The memory of the just is blessed." The tablet, which is very creditably made, and has attracted much admiration, was designed by Mr John Beebe, and made under the personal supervision of the firm of Messrs Beebe and Sons at their establishment, Mitchell street, to whom the making of it was entrusted by a committee appointed by the congregation. Riverine Herald (Echuca, Vic. : Moama, NSW), 16 April 1894.
" The memory of the just is blessed."